Our iCentre has retained the traditional library role as well as embracing the convergence of technology with teaching and learning and information exchange within a digital school. Our iCentre is dynamic and flexible, students are encouraged to be inquiry learners, creative problem solvers and develop the skills to work collaboratively and to take risks with their learning. Mr Hounsell, one of our Assistant Principals and Digital Learning Coordinator, Mrs Cameron, our Librarian and iCentre Coordinator provide expert support and advice to both students and staff and increasingly to parents and community members. 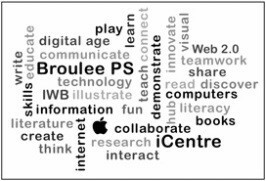 Students and Teachers at Broulee Public School enjoy access to current, functional and appropriate digital tools. Centrepiece is the iCentre, a 21st Century Library Installation equipped with 31 camera equipped iMac workstations, 2 Interactive LCDs, a sound insulated Tiered Learning Room, a Video Conferencing facility and a great collection of books linked to a computerised borrowing system. Cyber safety is ensured by sophisticated internet filtering systems, individual student activity monitoring and a proactive cyber safety teaching program. All students 3-6 have their own GSuite and personal Google Drive, accessible on any device in the school. All school computers have software chosen for educational effectiveness. Wireless access is available throughout the school as well as high speed hard wired network outlets in all classrooms. Each classroom K-6 has a pod of desktops or laptops to further enhance learning opportunities. iPads and iPod touches were introduced into the learning mix in 2011, and are now an embedded feature of our learning programs. Interactive Electronic White Boards or Interactive LCDs are featured in every classroom. Most boards are Promethean ActivBoards and use innovative Inspire software thanks to recognition and site sponsorship from Promethean. Our school also receives sponsorship from Ideal Resources, providing the students with access to their highly acclaimed Maths and Literacy software. As a Digitally Normalised School, all teachers are issued with a laptop and an iPad. Teachers, along with their students and families have 24/7/365 access to curriculum software such as IXL Maths/English and Brainpop and Brainpop Jr. The laptop program includes our support staff. The Special Projects Group will be focussing on EV3 Robotics and Coding, predominantly using the Scratch programming language developed by the Massachusetts Institute of Technology, but also Unity and Swift Playgrounds (Xcode). Some students also work on Music and Publishing projects. Student created digital images incorporated into student published documents, presentations and class blogs feature prominently in our curriculum. The Media Group publicises school events with the students gaining valuable experience in media creation and public relations.